These benefits are not realized just by obtaining the licenses for the three products, but by deploying them and their features in a specific way that includes integration and state-of-the-art security. FastTrack is an ongoing and repeatable benefit—available as part of your subscription—that is delivered by Microsoft engineers to help you move to the cloud at your own pace. FastTrack also gives you access to qualified partners for additional services. With over 40,000 customers enabled to date, FastTrack helps maximize ROI, accelerate deployment, and increase adoption across your organization. See FastTrack for Microsoft 365. If you want to take advantage of FastTrack to deploy Microsoft 365 Enterprise, you can use the FastTrack Microsoft 365 deployment advisor for guidance on how to deploy and set up your foundation infrastructure. Note that you must be signed on as a global administrator in an Office 365 or Microsoft 365 tenant in order to access this page. Get started on your end-to-end deployment journey with FastTrack here. 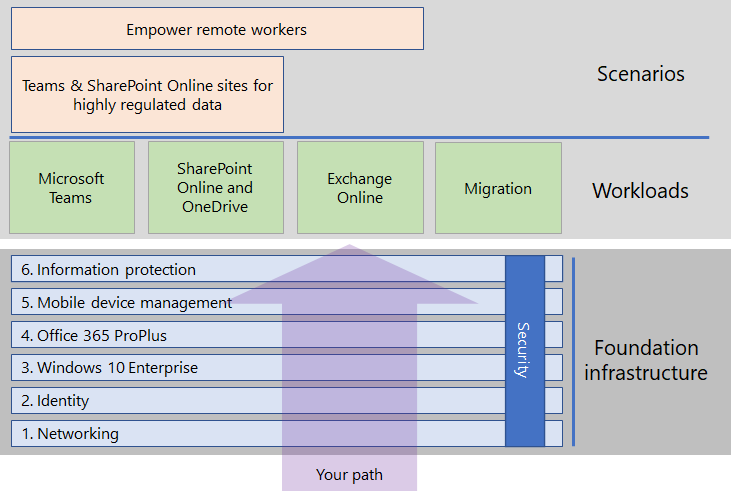 The Microsoft 365 Enterprise Deployment Guide steps you through the correct and required configuration of Microsoft 365 Enterprise products and features. Deploy the foundation infrastructure for built-in security and integration for simplified management, which makes it easier to ensure your client software is updated with the latest productivity and security enhancements. The foundation infrastructure is organized as a series of numbered phases that build upon each other and towards an environment that supports Microsoft 365 Enterprise workloads and scenarios. If you are a smaller or newer organization, follow the phases in order to methodically build out your infrastructure. However, you can deploy phases or the portions of phases of this infrastructure in any order as needed, one after the other or in parallel, to integrate with your current infrastructure, fit your IT plans and resources, and meet your business needs. If you are an enterprise organization, view the phases as layers of IT infrastructure, rather than a defined path, and determine how to best work toward eventual adherence to the requirements of each layer across your organization. Deploy key productivity workloads and scenarios on top of your infrastructure. These unlock creativity and teamwork in your organization. Here's the relationship between the foundation infrastructure and the workloads and scenarios. Workloads and scenarios operate over the top of the foundation infrastructure. However, you do not have to have all of the foundation infrastructure phases built out to begin using workloads for productivity and collaboration. Get self-started on your end-to-end deployment journey here. If you're new to Microsoft 365 Enterprise or to a specific product or feature, one of the best ways to gain understanding is to build it out yourself and see it working. We've made this easier with Test Lab Guides (TLGs), which step you through the configuration of infrastructure or a feature in a simplified but representative environment using trial or paid subscriptions. With TLGs, you can self-learn, demonstrate, customize, or build a proof of concept of a complex configuration, workload, or end-to-end scenario. For more information, see Microsoft 365 Enterprise Test Lab Guides. How did others do it? Use these resources to understand how others have deployed and are using Microsoft 365 Enterprise. Take a peek inside Microsoft IT and learn how they deployed Microsoft 365 Enterprise and how Microsoft employees use it every day. The Contoso Corporation is a fictional but representative global manufacturing conglomerate with its headquarters in Paris, France. See how Contoso deployed Microsoft 365 Enterprise and addressed major design decisions and implementation details for networking, identity, Windows 10 Enterprise, Office 365 ProPlus, mobile device management, information protection, and security. To do it with direct Microsoft assistance, use FastTrack. To get started doing it yourself, see the foundation infrastructure.